The football season is behind us as the Patriots beat the Rams to capture their 6th Super Bowl Championship. When it comes to the offseason, there’s usually plenty of action and transactions that take place. One of the biggest stories will be where will Antonio Brown will be playing next season? As we all know, Antonio Brown and the Pittsburgh Steelers bumped heads at the end of the year. In the final week of the season, Brown was forced to sit because of various reasons. The owner of the Steelers said in an interview that he doesn’t envision Antonio Brown being with the team moving forward. Before all that happens, will anything come out of his recent domestic issue? Let’s take a look at what teams Antonio Brown could play for in 2019. In an interview, the great Jerry Rice stayed that Brown wanted to play for the 49ers. It seems that Brown have echoed those sentiments and it would be an ideal situation for him. Jimmy Garoppolo should be ready for the season after suffering a torn ACL. San Francisco is looked at as one of the sleeper teams this upcoming season in the NFC. The 49ers don’t have a legitimate #1 receiver and adding Brown would open up the offense. Would the addition of Brown help the 49ers challenge the Rams and Seahawks in the division? 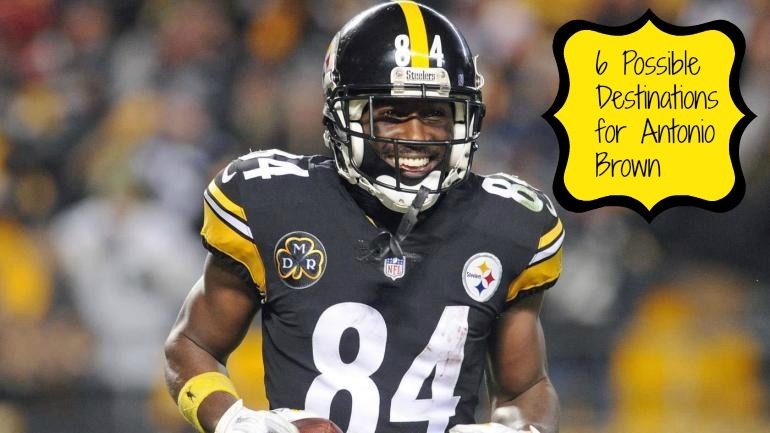 Could Antonio Brown be a Steeler at the beginning of the 2019 season? We all know that the owner has stated that Brown won’t be back with the team. Let’s remember, this was at the end of the season and emotions were high. Pittsburgh should be challenging for a championship and bringing back Brown would be the right decision. With a healthy James Connor returning, the window is closing with Ben Roethlisberger at the helm. Do you think Brown and the Steelers work things out and have him return for another run? Anytime a veteran is mentioned that be on the move, Oakland is usually one of the destinations. Oakland is coming off a horrible season, but they could easily catapult themselves back into contention with the addition of Antonio Brown. With 3 first round picks in the NFL Draft and a ton of money in cap space the Raiders could be back into contention. Since they traded Amari Cooper, the Raiders could use a #1 WR. Will Jon Gruden try to maneuver and make a move on one of this generations best wide receivers? Cam Newton is coming off another shoulder surgery, but they said he’ll be ready for training camp. If the arm strength of Newton return, Antonio Brown would be great in Carolina. Just imagine Antonio Brown in this offense to go along with Christian McCaffrey. Being in the same division as the New Orleans Saints and Atlanta Falcons, you will need to put up numbers. Brown and Newton have huge egos, but they both have something to prove and will be hungry to finally win a championship. The Green Bay Packers are coming off back-to-back disappointing seasons. The offense hasn’t looked the same and they need to add pieces if they’re going to make another run. Aaron Rodgers could use another piece and Brown would be a perfect match with DeVante Adams. The Packers running game is finally coming along and if Rodgers have two All-Pro receivers, the sky is the limit. Would the Packers make such a move? Could LeVeon Bell and Antonio Brown be on the same team in 2019? The Jets have a new coach in Adam Gase and he would love to make a splash in the tough New York market. New York have a ton of cap space and they could use the money to put pieces around Sam Darnold. If the Jets were to land both of these guys, it would send a message to the Patriots that they need to take them seriously. Do you think that Antonio Brown will leave Pittsburgh? If so, where do you see him landing in 2019? Do you think any of the teams mentioned will be a landing spot for him? Leave some feedback below.